Former New York Gov. George Pataki at the Iowa Ag Summit in March in Des Moines, Iowa. George Pataki has decided to end his presidential bid. Pataki is a serious person with a long, successful career in politics, including three terms as New York’s governor. But his bid for the Republican nomination was doomed from the start, and he never got off the ground. 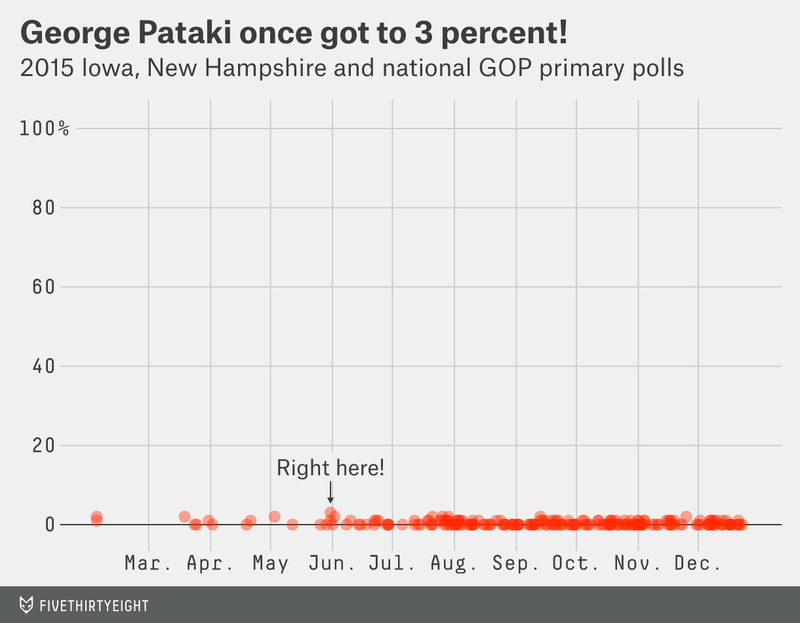 In the 221 polls that asked about Pataki, he registered 0 percent 149 times. He earned more than 1 percent just 10 times and more than 2 percent only once. Put another way, you could add up Pataki’s support in every national, Iowa and New Hampshire poll and not reach 100 percentage points. His sum is only 83, or what Donald Trump gets through the summing of about two national polls these days. Whom does Pataki’s dropping out benefit? Watch: What Harry got wrong in 2015.